FILE - Brazil President Dilma Rousseff arrives to speak to members of the media during a visit at Google headquarters in Mountain View, California, July 1, 2015. Brazil's largest party is standing by deeply unpopular President Dilma Rousseff for now despite the defection of one of its own leaders, but that could change if an expected recession stirs up social unrest, party leaders say. Rousseff is struggling to save her presidency amid the worst economic downturn in 25 years and a political crisis set off by a massive kickback scandal at state-run oil company Petrobras implicating dozens of politicians from her coalition. Eduardo Cunha, speaker of the lower house of Congress, broke off ties with Rousseff and wants his Brazilian Democratic Movement Party (PMDB) to pull out of the coalition but other party leaders say they are not ready to do that. Instead, they plan to stand by Rousseff until 2018, when the party plans to field its own presidential election candidate. "We will not break with her government now because that would worsen the serious economic situation Brazil faces in the second half of the year," Senator Eunicio Oliveira, the PMDB's leader in the Senate, told Reuters. Just six months into her second and final term, Rousseff is walking on thin ice. Polls show that almost two in every three Brazilians would like to see her impeached for mismanaging the economy and allegedly using kickback money in her 2010 and 2014 election campaigns. Her approval rating dropped to 7.7 percent in one poll published last week. Rousseff's own leftist Workers' Party has attacked the austerity measures she has adopted to curb a growing fiscal deficit that threatens Brazil's investment-grade credit rating. Even her mentor, former president Luiz Inacio Lula da Silva, has distanced himself. Rousseff's isolation in a rebellious Congress has undermined her belt-tightening policies. Combined with falling revenues in a shrinking economy, her economic team has had to lower its fiscal savings targets for 2015 through 2017, increasing the risk of a downgrade by credit agencies. While Cunha will try to obstruct her agenda, continued PMDB backing means Rousseff still has a chance of getting further bills to cut spending and raise revenues through an unruly Congress that has so far diluted her austerity measures. Rousseff's risk of impeachment rose 10 days ago when Cunha, a conservative PMDB leader, declared he was switching to the opposition after accusing the government of seeking to implicate him in the Petrobras corruption scandal. "I believe most of the PMDB today opposes the alliance with the Workers' Party," Cunha said on Monday at an event in Sao Paulo. 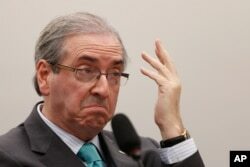 Cunha said he was "not going to burn down the country because of a personal feud" but he warned that the impeachment debate will not go away and will continue to hurt business confidence in Brazil. His first step after defecting was to start examining the merit of 11 requests before Congress for Rousseff's impeachment. He said on Monday he would weigh their technical merits, according to congressional rules of order. Rousseff is not among the 32 sitting politicians suspected of receiving kickbacks in the widening Petrobras investigation. That does not mean she is in the clear, however. Cunha could get legal ammunition to seek impeachment if a federal audits court finds the government fiddled fiscal accounts last year to make them look better. A verdict is expected in late August. Still, neither the PMDB nor the main opposition party, the centrist Brazilian Social Democracy Party (PSDB), are seeking Rousseff's impeachment, preferring to let the Worker's Party take the blame for Brazil's economic woes and thus enhance their own chances in the 2018 presidential race. Brazil's economy is expected to contract 1.7 percent this year, unemployment is rising and inflation is stubbornly high, so any surge in popular unrest could push Rousseff's wavering allies over the edge. "If Brazilians take to the streets massively to demand a change of government, then there will be no way to hold this already fractious coalition together," said PMDB lawmaker Danilo Forte, a critic of his party's marriage to the Workers' Party. Rousseff's strategic affairs minister, Mangabeira Unger, said there was no legal basis to remove the president. "Not even her worst adversaries have accused her of any moral transgression," Unger said in an interview, adding that impeachment would precipitate a crisis that is not in the interest of any of Brazil's main political parties. A gauge of anti-government sentiment will come on Aug. 16 when nationwide protests have been called against Rousseff. Forte said things would be even worse for Rousseff without her vice president, PMDB veteran Michel Temer, who has taken charge of her relations with Congress. An aide to Temer said the vice president has sped up patronage appointments to keep Rousseff's allies happy, including directors of state companies and regulatory agencies. He also released 800 million reais ($237 million) last week in pork-barrel funding for lawmakers' districts, with another 5 billion reais available by year-end.